← Why Bother with Evangelism? 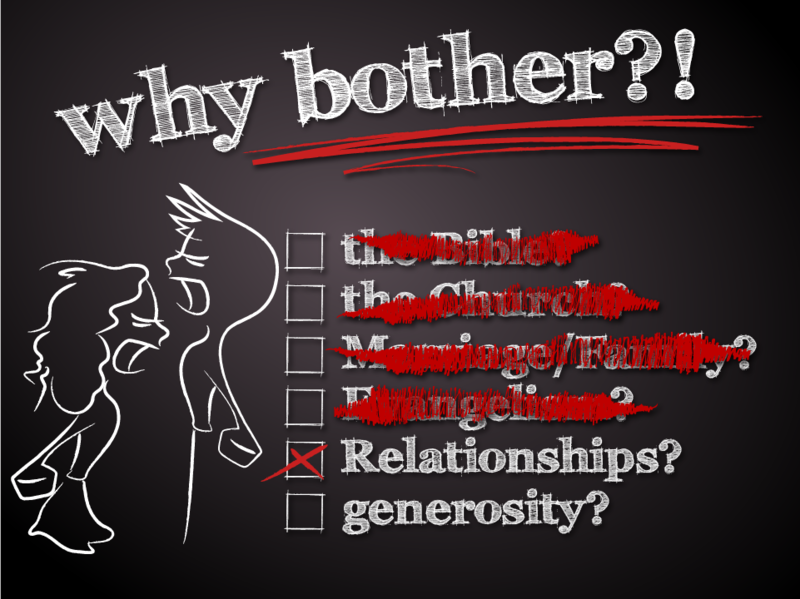 Bridge Church in Madisonville is in the midst of a sermon series called Why Bother? We’re looking at things culture is pressing us to devalue but God counts as of great value. One thing thats valued less & less is relationships. We don’t build front porches onto our homes much anymore. Instead we build “privacy fences” in the backyard. Loneliness plagues neighborhoods & people who have hundreds if not thousands of Facebook friends. And relationships can be hard & messy, unlike the video game that we can hit restart on, or the relational lives of television characters that we live vicariously through in our imagination. It may not be lack of desire, but lack of intentionality. So Why Bother with Relationships? Why do we need greater intentionality? Why should we push through difficulty to build deep relationships with others? 1. God’s primary purpose was & is to RESTORE RELATIONSHIPS. Isaiah 59:2 reminds us that sins separates humanity from God & that separation extends to our earthy relationships (James 4:1). What is God doing in the world? Restoring Relationships (see 2 Corinthians 5:18-19). As we relate with God, his desire for relationship will spread to us & through us to others. 2. Jesus bothered with RELATIONSHIPS. In the gospels, we see Jesus spending time with a small group of 12 followers who he called friends (John 15:14-15). Then he had an inner circle of three that he shared an even greater depth of relationship (Matthew 17:1). We also see Jesus initiating relationships with difficult people like a crooked tax collector named Zacheus, a promiscuous Samaritan Women at a well, & a Jewish religious leader named Nicodemus. Jesus demonstrated intentionality in relationships & used relationships as the primary means for spreading the gospel. What an ineffective communicator Jesus was by our modern standards of platform building. He could have spoken to hilltops of thousands of people each night, but instead he wasted time at dinner with a handful of tax collectors and strangers. Want to change the world? It’s easy. Have a long, time-wasting, friendship-generating dinner with someone. 3. Jesus commanded us to bother with RELATIONSHIPS. Jesus not only set the example of intentional relationships, he took this to “COMMAND FROM GOD” status in John 13:34-35, then in John 15:12 & John 15:17. Also, in stories like the Good Samaritan, where Jesus presses his people to put the needs of others ahead of themselves, even despite busy schedules & cultural differences (Luke 10:25-37). And he adds in the Sermon on the Mount (Matthew 5:41-48) that we are to love even the most unlovable, like Roman soldiers that make unjust demands, & avowed enemies. With Jesus, intentional relationships are not an option for His followers. Here’s a great Infographic with all of them listed. 5. RELATIONSHIPS bring growth & change into our lives. Proverbs 27:17 says, “As iron sharpens iron, so a friend sharpens a friend.” That’s a great image of the importance of friendships. I have a tool in my garage to sharpen my lawn mower blades. it’s called a Grinder. And when sharpening blades, it gets messy. Sparks fly. The noise is annoying. But the end product is a sharper tool & a cleaner cut. Without relationships, we run the risk of remaining dull & less effective as followers of Christ. So God compells us to sharpen one another. To push through the sparks that may fly as we grow & change through relationships. Today there’s a great mission field to be had for the Christian that will be intentional about Relationships. We have so many lonely people. In our neighborhoods are people with few relationships. People are searching for answers in impersonal ways, but are open to a friend that will help them. Be intentional. Show up. Engage. Love. Serve. And see how God uses you. Posted on May 26, 2015, in Bridge Church, Message Notes and tagged Bridge Church, One Another, relationships. Bookmark the permalink. 1 Comment.